Province is an active adult community with a guarded entry and a community center that is sure to impress. Province boasts a 32,000 square foot clubhouse that features something for everyone; a resort-style outdoor pool, an indoor lap pool, ballroom, fitness center, café, basketball court, outdoor amphitheater, bocce ball and tennis courts. Originally developed by Engle starting in 2003, construction in Province came to a halt after Engle filed for bankruptcy in 2008. Shortly after that Meritage acquired the remaining lots. 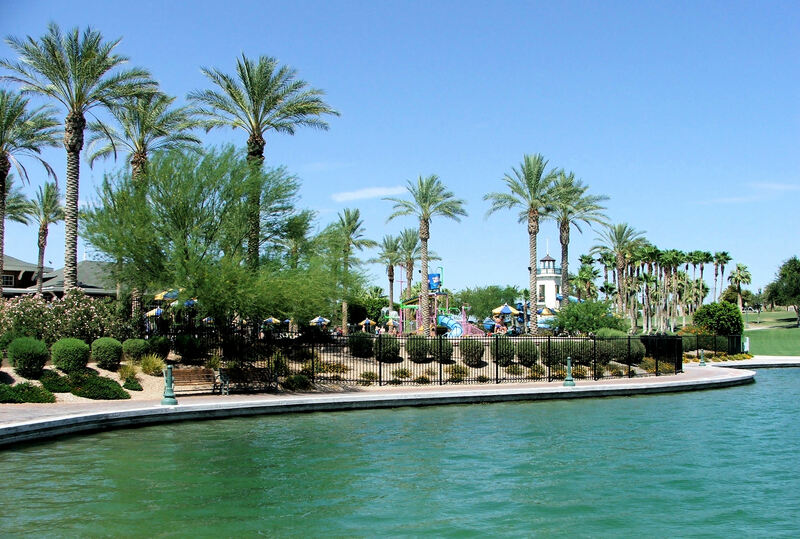 Mesa has a variety of lake communities; ranging from newer waterfront condos in Superstition Lakes to active adult waterfront homes in Leisure World. 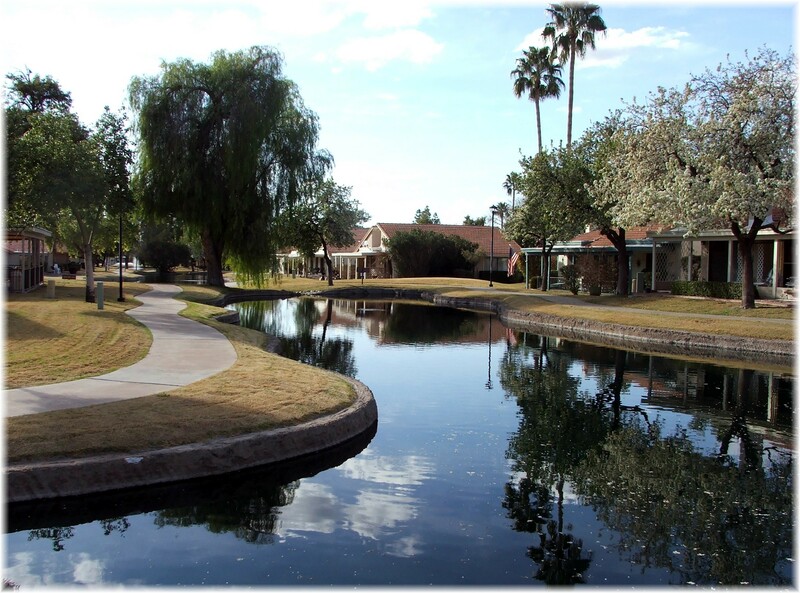 Dobson Ranch is the largest lake community in Mesa located next to the Dobson Ranch municipal golf course. Dobson Ranch waterfront townhouses and condos can be found in developments such as The Landings, Water Works, and Lake Park Development. Retirement Community with lakeviews at Leisure World in Mesa Az. Leisure World was established in 1972 and I’m sure it was considered to be “way out there” in east Mesa. 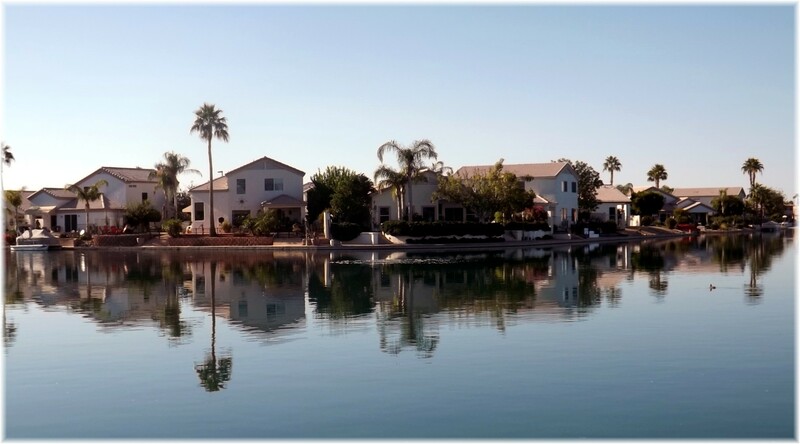 Now this 1.5 square mile active adult/retirement lakefront gated community with waterfront homes is part of the greater Phoenix area that connects seamlessly with the rest of Mesa and neighboring cities. Build out occured in 1994 with over 2,600 homes, both condos and single family homes, built by three builders; Western Savings, Dietz Crane, and Rossmoor. Leisure World residents can be a young as age 45, as long as 80 percent of all residents are 55 and over. 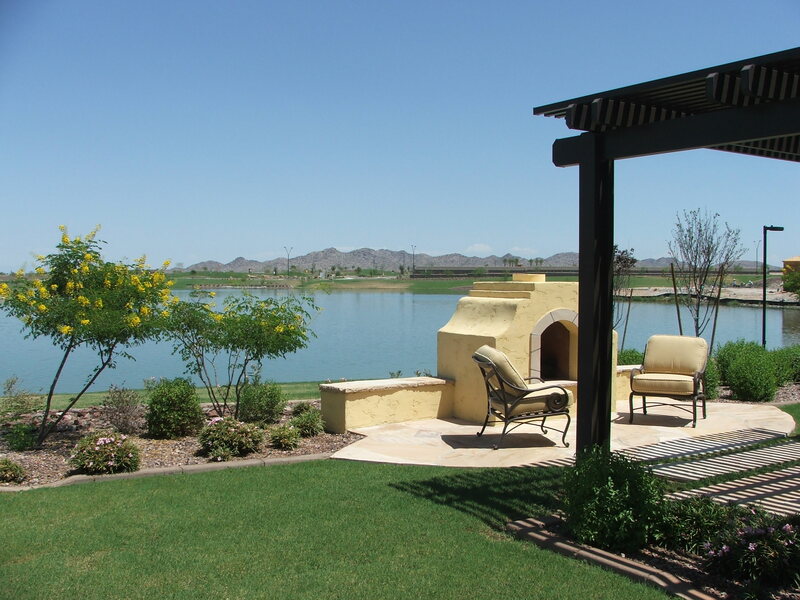 My search this week for waterfront and lake communities in the Phoenix area landed me at CantaMia by Joseph Carl Homes in Estrella Mountain Ranch in Goodyear. This active adult retirement lake community features 17 acres of lakes in phase I and 23 acres in phase 2 & 3. Total homesites at buildout will be just under 1,800. CantaMia offers 14 home plans that range in size from 1,189 to 2,852 square feet and will also feature its own community center that promises to be one of best in the valley. CantaMia residents also have access to the impressive Starpointe Residents Club. Estrella Mountain Ranch in Goodyear is home to its’ largest lake community that according to planning documents has the potential to grow to 50,000 homes and 1,600 acres of commercial development. This secluded community has one of the best community centers, resident waterpark and community pools in the west valley, and is located right next to the 19,840 acre Estrella Mountain Regional Park. Nestled next to the Sierra Estrella mountains just 8 miles south of the I-10, Estrella Mountain residents enjoy over 40 acres of parks that include pathways, pavilions, an amphitheater, basketball, tennis and volleyball courts. On the lake north lake is the Yacht Club that offers sailboats, paddle boats, canoes, and kayaks. Estrella is also home to a Nicklaus-designed championship golf course. 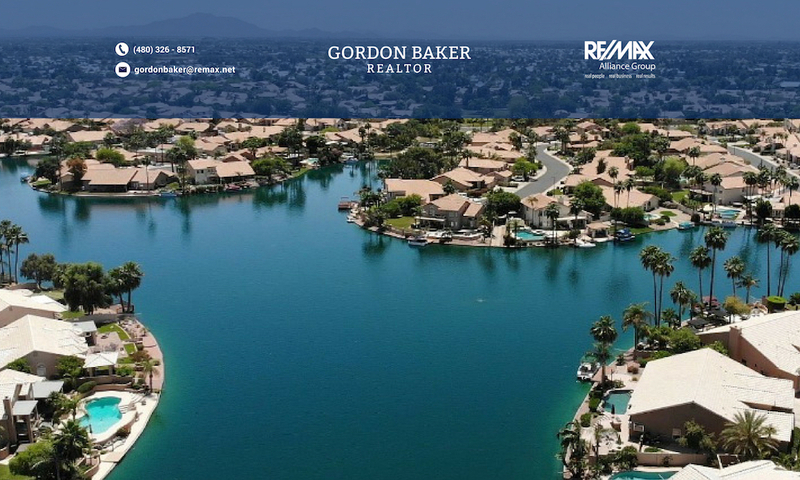 When looking for Phoenix area waterfront homes, your dream home could be hiding behind one of the gated lake communities featuring waterfront homes. 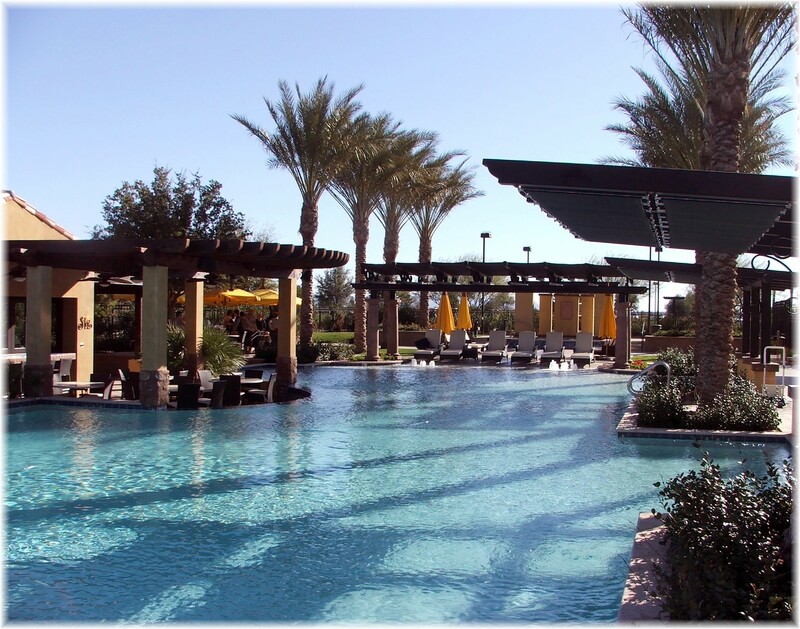 These unique gated subdivisions are spread throughout the valley in cities and towns such as Chandler, Mesa, Maricopa, Scottsdale, Tempe and Gilbert among others. Ventana Lakes lake community is the only community that I know of in the Phoenix valley that is part of two cities, Peoria and Sun City, and covered by two zip codes, 85373 and 85382. Those residents that live west of 107 Ave. are in Sun City 85373, while the Ventana Lakes residents on the east of 107th Ave. are part of Peoria 85382. Regardless of the city or zip code, all belong to the Ventana Lakes Property Owners Association. Ventana Lakes , situated on 480 acres, has been recognized as the “Adult Community for the Young-at-Heart”. Province was voted the Best Active Adult Community in 2006 by the National Association of Home Builders’ 50+ Housing Council. 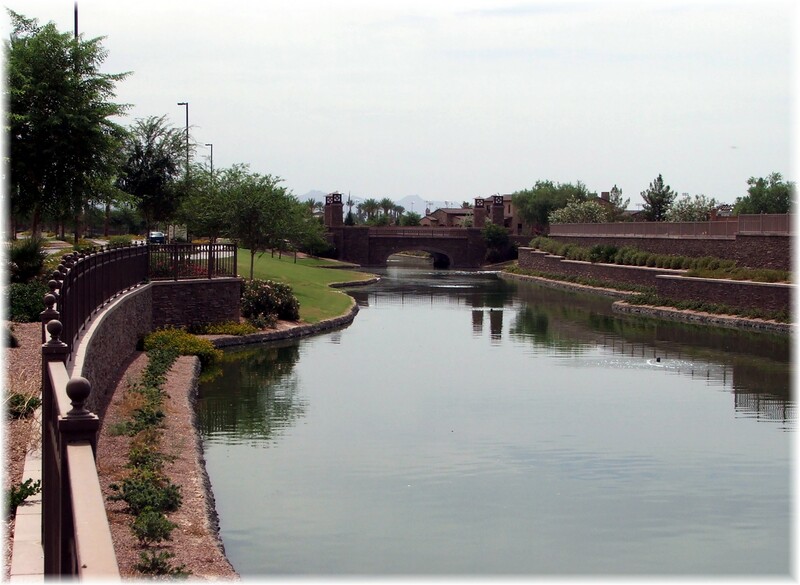 It is one of the best maintained communities in Arizona and offers residents a wide range of amenities. This guard gated active adult lake community includes 50 acres of man made lakes, 125 acres of parks and greenbelts and a clubhouse second to none with over 30,000 sq.ft.